Rutini is a winery in the Maipu Valley in Mendoza, Argentina. It was founded in the late 19th century by Italian winemaker Felipe Rutini. 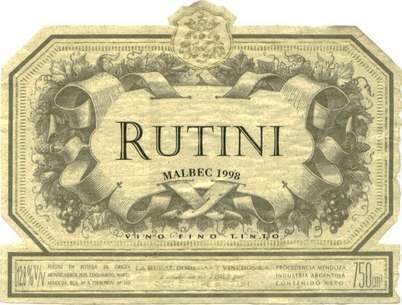 In 1994, Rutini was acquired by Argentinian winemaking icons Nicolas Catena and Jose Benegas Lynch, who have elevated the winery to become one of the region’s top quality producers. In Argentina, Rutini is among the most prestigious widely available brands, and this wine offers a few hints why. Inky and dense with attractive berry aromas and a touch of cinnamon and sweet spice. A fully, fruity wine, with excellent body, intense tannins, flavors of cherry, blackberry, boysenberry and plum intermingled with hints of cardamom and pepper, a long, full finish. It’s a delicious wine to accompany a barbecue! I suggest you to store it for a year or so before open it! This entry was posted in Restaurant and tagged Delicacies, Food, Restaurants, Wine by pointerwingshooting. Bookmark the permalink.